Stilo International plc (“Stilo” or the “Company”) has been notified that David Ashman, the Company’s Chairman and Non-Executive Director, purchased 475,000 ordinary shares of 1p each in Stilo (“Ordinary Shares”) at 3.7p per Ordinary Share on 29 May 2018. Following this purchase, David Ashman, and persons associated with David Ashman, have a beneficial interest in 24,083,910 Ordinary Shares, representing approximately 21.14 percent of the issued share capital of the Company. Stilo International plc (AIM:STL), the AIM quoted software and cloud services company, announces that all resolutions proposed at its AGM held earlier today were duly passed without amendment. Stilo International plc (“Stilo” or the “Company”) (AIM:STL), is holding its Annual General Meeting later today. The Company develops software tools and cloud services that help organisations create and process structured content in XML format so that it can be more easily stored, managed, re-used, translated and published to multiple print and digital channels. 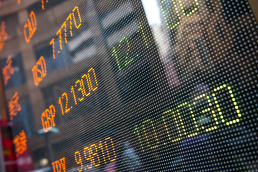 “Sales projections for the current financial year remain in line with management forecasts, albeit, as always, dependent on the materialisation of key contracts. The Company has taken on more sales and technical resources to help deliver on pipeline projects and generate new business, which, while impacting the Company’s cost base and short term profitability, should underpin our projected growth in 2019 and beyond. The Company remains un-geared, and cash balances at 30 April 2018 stood at £1,358,000 (31 December 2017: £1,621,000). Presented by Amber Swope, DITA Strategies, Inc.
Can you easily find content created by other teams? Is content consistently structured across the enterprise? Do you have a common content lifecycle management strategy? 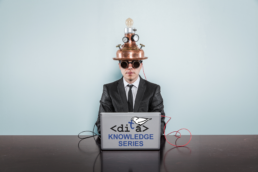 If you answered “no” to any of these questions, then join us for this Stilo DITA Knowledge Series webinar featuring guest presenter, Amber Swope, president of DITA Strategies, Inc., for a discussion on using content collections to share content. Content collections are libraries of organized, labeled, source content units that are accessible by the appropriate people. Let’s talk about strategies to create and share the right content in your organization. Amber is an internationally-recognized expert on the Darwin Information Typing Architecture (DITA), creator of the Information Architecture Blueprint™, and president of DITA Strategies, Inc. With over 20 years of experience in the information development field and 12 years of DITA expertise, Amber helps teams design, develop, and optimize their information architecture (IA) and implement DITA to improve efficiency and reduce costs. 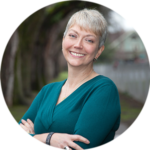 Amber has authored numerous papers and articles on information design, development, and architecture, and has presented at leading industry conferences as a DITA expert. She holds a master’s degree in technical and professional writing and a certificate in computer technical writing, both from Northeastern University. 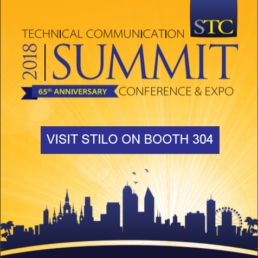 Stilo is pleased to once again be one of the merit sponsors of this year's Society for Technical Communication Summit - you will find us in the Expo Hall on booth # 304. STC’s Technical Communication Summit is the premier conference for technical communication education and networking. The conference attracts over 600 attendees and 40 exhibitors during a 3 day period and brings together like minded individuals to grow in their knowledge of the technical communication field. The 2018 Summit takes place 20-23 May at the Hyatt Regency Orlando in Orlando, FL. The Summit kicks off Sunday evening with the Welcome Reception in the Expo Hall. The 2018 theme is ‘Communicate the Future’, which will be reflected in the overall program of events as well as individual education sessions. The Education. Organized in tracks, these sessions begin Monday morning and continue through Wednesday morning. Sessions are offered in a variety of formats and tracks. The Expo Hall. This opens on Sunday evening and features numerous companies, all prepared to unveil and demonstrate new and exciting products, services, and technology to the world of technical communication. Find out more about the STC 2018 Technical Communication Summit.